Article by Kate Dempsey © 6 September 2012. The winner will be announced this weekend at the Poetry Now Festival. Kingston Hotel, Sunday 9th September at 4pm. Entry €5. Hello Noel and welcome my blog. How did you first get into poetry? When I was in first year in secondary school, our English teacher asked us to write a poem. (He was probably after an easy afternoon!) I wrote something called ‘In the City at Night’ which was a bleak portrait of Dublin in the small hours. Other kids wrote poems about hating cabbage and the like. My teacher liked my piece so much he put it in the school magazine. I remember the sense of excitement and my hope that a friend’s sister might see it. I don’t know if she ever did but it was the first spark of excitement about what you could do with language broken up into lines. (I saw it again recently and I have to say it was pretty good for a 13 year old). I enjoyed poetry in school after that, but couldn’t reproduce the magic of writing poems. Much later, in my final year we studied Thomas Kinsella’s ‘Mirror in February’ and it really had a powerful impact. It was a poem written by a poet who was still alive (the only one of the syllabus at the time) and again I was struck by how much you could say – and convey emotionally – in such a short space. Despite this interest, in the end, I choose to study Natural Sciences at university, majoring in Experimental Physics. I still kept up an interest in poetry though, reading almost exclusively 20th Century poetry (recommended by friends in English) such as e.e. cummins, Wallace Stevens, Eliot and so on. At this point, I still assumed my future was in physics and I graduated with a first and looked into doing PhDs at various colleges in the UK. I decided though to take a year out and we all know that that can be fatal to your future studies! In truth, I didn’t particularly like lab work and it precipitated something of a crisis and the way I found to deal with that was to try write poetry. This was around late 1993. My first stuff was all flow of consciousness, impressionistic musings and pretty awful to boot – thankfully now lost – but I remember encountering Seamus Heaney’s collection Seeing Things around that time and decided to try write ‘a bit like him’. I went to Bewley’s Cafe on Grafton Street with the sole purpose of writing a more formal type of poem. I managed to write a piece called ‘Mama’s Dance’ (which was a play on Theodore Roethke’s ‘Papa’s Waltz’) and recognised that something had clicked in my writing. I started doing it with more intent after this breakthrough and published my first poem in Poetry Ireland Review about 18 months later in autumn 1995. So I guess the first poem I wrote in school was a seed and that evening in Bewley’s was a turning point. How do you think your Science background influences your writing? Both subject matter and the way you write? Well, that first published poem was called ‘Apple‘ and was a piece about Isaac Newton so from the beginning I was drawing on science. I should say, I was a very dedicated physics student and loved the subject – and science in general – so it seemed natural to try write about that, among other things. As well as Newton, I wrote pieces about Galileo’s discovery of the moons of Jupiter and a dramatic monologue by an unnamed woman (in my mind, a housekeeper) about Einstein as a child (‘Einstein’s Compass’). The strange thing, though, is that I moved away from physics as subject matter and started a series of poems about insects (bees, wasps, ants and so on) as well as geology, palaeontology, anthropology and even mathematics. There were also, of course, poems about more emotionally direct material such as family, lovers and loss etc. It wasn’t really clear at this point what I was trying to do, but as the poems accumulated, I recognised that a pattern was emerging with the science poems acting as a kind of grand backdrop to the smaller, more personal human dramas. In a sense, the book was like life played out against the epic scale and timeframe of nature and the fleeting nature of life positioned beside or, perhaps, against this. As to how my background in science affects the way I write, that is a harder question to answer. Someone asked me recently why as a ‘physicist’ (I pointed out a very much lapsed one!) I wasn’t more interested in a more formal poetics. By this they meant, I think, why I didn’t writing in fixed forms such as sonnets, villanelles, sestinas and so on; they thought that would appeal to someone with a mathematical slant. To be honest, I’ve never been terribly interested in these forms. To go back to the evening in Bewley’s, I think I realised that ‘form’ wasn’t the same thing as conformity or whatever other notions I was carrying around with me. So, let’s say, shape and some kind of formal design entered my work then. At the same time, I’m not that interested in language as a puzzle game in the way that certain writers approach it (I’m thinking of someone like Paul Muldoon who does that brilliantly). Perhaps, having studied the biggest ‘puzzle-game’ we know in science, I sought out poetry to sustain a part of me that also needed to express experience and emotion and not to be locked down by too many rules. So there is – I think at least – a formal quality in what I write which perhaps reflects my background in science, but I’m not what you’d call a formalist per se. It’s as the poem requires! That said, I really do admire those poets who write in fixed forms and make them seem organic. Your first book was two novellas. Tell me about that. I had my novellas The Return Journey & Our Friends Electric accepted for publication with Bluechrome but they went bust just before they published it. I was disappointed at the time but in retrospect, if they’d gone bust after publication, it would have been worse. Adele Ward who published with Bluechrome then joined forces with Mike Fortune-Wood (who had previously managed the Cinnamon Press) and together they started Ward Wood in summer 2010. So I sent them my novellas in September 2010 and they were published in February 2011. I noticed that they also publish poetry so I sent them my collection, In the Library of Lost Objects and that was published in June 2011. Why did you choose Ward Wood? Well, it’s hard to get a publisher to begin with and while I had one offer by then, I would’ve had to have waited over 2 years for publication. I heard about Ward Wood at this point and they seemed like a fresh new press. They took the collection on straight away. Also as I was only the 3rd person on their list so I felt our relationship was more personal. That’s since proved to be the case. How did you get your first collection ready for publication? I had been working towards that collection for some time. The sensibility of the book was formed in 2001 when I was 30. I did a Masters in Creative Writing in Galway with the idea of finishing. In 2005, I thought I had the manuscript ready and I sent it out. In hindsight, I sent out too soon. I went back to a folder of poems that I hadn’t quite managed to finish and realised most needed to be just edited back. Some important poems came out of that process, which I added to the 30 poems that remained, so these 40 pieces were my finished collection. By this time, I had been honing the book for a long time, but I realised then that it was finished – which was a massive relief! My editor later did a close edit of the poems. She’s a very good close reader of material and helped with nuance and detail in several pieces, as well as punctuation and occasional lapses into prose. But the initial list of 40 she saw, were the final 40. She now has some readers who you can send work-in-progress to and get feedback at important moments. That’s been very helpful with the collection I’m currently working on. Do they give different responses? Sometimes the advice converges, sometimes it diverges completely. And I’m there thinking, which way do I go? I have made changes based on some comments, but not all. Sometimes I changed things and then just changed them back. I have more confidence now with one book published and sometimes you’ve got to trust your own ear and instincts! The period when I was getting rejection letters for the first collection was very difficult. You begin to wonder if the collection will ever come out. And then even getting a publisher isn’t the end. Beyond that, it’s how people respond. Another thing I hadn’t expected was how it affected people who don’t read poetry, how it found its way to them. I was trying to create a narrative with the ordering of the poems but many people told me they dipped in and out rather than reading the whole thing from start to finish. You have to accept that people will cherry pick poems, which is fine, but I did spend a lot of time sequencing the book to create a kind of emotional arc through the collection. I hope some people, at least, have noticed that! The Poetry Book Society review was a great start and drew some magazine editor’s eyes to the book, particularly in the UK. There were also reviews in Poetry Ireland Review, Orbis and in Magma. One response talked about how one piece (‘Baltic Amber’) pulled a lot of threads together to give the book cohesion. I wouldn’t have recognised it in those terms – as being so central to the collection, I mean – but I did place it near the end of the book and poems there are intended to complete the narrative I mentioned. Even doing things like this interview make you think it through more. Speaking about the poems can be sometimes harder than writing them, but it’s very useful I find. It’s like holding the work up to a mirror and sometimes being surprised by it and how others see it. And then you were nominated for the Strong Award for a first collection. Yes. It’s great. These awards help draw attention to your work. Ward Wood is a London-based publisher and the book is in some shops there. Hodges & Figges and Dubray Books both took it on the basis of the nomination. That was very lucky. There are fewer bookshops now that stock debut collections. But credit should also go to Book Upstairs who carried the book from the beginning and are great champions of new Irish writing. How far along is your second collection? It’s called On Light And Carbon and again I’ve been combining science poems and personal poems. I’ve been playing with the different meanings of light and carbon. It’s nearly there in a rough draft. I’ve been editing seriously for the last couple of months. It’s coming together more quickly than I expected. It was written in a much more contracted time frame than the first collection;I was also lucky enough to get an arts council grant so I could devote a lot more time to writing this year. I’ve also used a slightly different approach with this one by trying to write a first draft of each poem as quickly as possible to try maintain the movement of intent and emotion. That said, I’ve probably only used every other poem I’ve written for the book. The general idea for this collection is to explore the physics of light and waves, both as literal ideas and as metaphors. Even though I didn’t go on in physics, I have a passion for it and science in general so it informs how I see the world. I try to make such poems both readable and intelligible for non-scientists. You don’t have to be a scientist to write about science, or I should add, to understand them. For example, in a poem called Harmonic Resonance, I try to explain the concept within the poem, rather than adding it as a footnote. But there has to be more to the poem. The physics was a starting point but it turned into an elegy to my friend’s father, who was a very fine pianist. In the end, I think a poem has to be more than an idea. Is your first collection available in ebook format? Yes, it’s coming out on Kindle. It’s much harder to layout poetry in this form due to line breaks and stanza patterns and so on but my publisher has found a way to do it and we have to cover that base. E-books look like they are now beginning to outsell paper books. And poetry books are sold in fewer and fewer places now so maybe it will help to make the work more available. Ward Wood also encourage their authors to have a good online presence. Facebook, in particular, is a nice way of meeting poets. I’ve met some in real life who I first encountered online. I’ve also put some of my poems in various places on the web. The conundrum is if lots of the poems are available, then large chunks of the collection may have been read already. So there’s less reason to buy the book. It’s a balance really. In every creative writing class I’ve taught, there was at least one student with great talent. So talent isn’t as rare as you’d think. What’s really important is how hard you work after that. You should also read and learn as much as you can to refine your knowledge of the form. I’d also say, don’t be afraid to write badly, just write. Some poems will come out better than others and that’s fine. I’ve been writing for nearly twenty years and that’s still true. Some of the poems in my second collection were orphaned from the first, and others – in revised form – go back to my first year’s writing. The difference now is that I can make more of them with experience. Don’t be too precious about it either, nor think that rewriting is cheating as some new writers feel. Also, don’t always wait for lightening to strike. Meet the muse halfway! And one final word – and perhaps the most important – enjoy it. Noel Duffy was born in Dublin in 1971 and studied Experimental Physics at Trinity College, Dublin, before turning his hand to writing. He co-edited (with Theo Dorgan) Watching the River Flow: A Century in Irish Poetry (Poetry Ireland, 1999) and was the winner in 2003 of the START Chapbook Prize for his collection,The Silence After. His work has been published widely in Ireland and abroad, including Poetry Ireland Review, The Dublin Review, The Cuirt Journal and De Brakke Hond: Special Irish Issue (Belgium). His collection of two novellas The Return Journey & Our Friends Electric was published by Ward Wood in early 2011, followed by his debut poetry collection In the Library of Lost Objects, again published by Ward Wood. 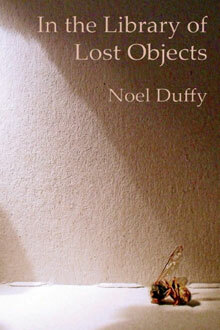 It been shortlisted for the 2012 Strong Award for Best First Collection by an Irish author.